Five Reasons to Love NYC Parks in the Summer! New Yorkers earn some serious outdoor time after surviving our long, snowy, wet winters. So the moment the temperature hits 70, we head to the sidewalk cafes, the waterfront, and especially the parks! Here are five fantastic reasons to love NYC Parks! From late May to mid August free tickets are available on a first-come, first served basis for these star-studded, only-in-NYC performances. For once the hottest ticket in town can’t be found on Broadway! This year the Public Theatre presents Comedy of Errors and a musical version of Love’s Labour’s Lost. These productions have been known to move to Broadway, so see it this summer (for free) so you can say you saw it first! City Parks Foundation hosts free concerts in over 750 venues citywide. But the most popular by far is Summerstage, which brings A-list talent like Adele and the Indigo Girls to Rumsey Playfield, off of West 72nd Street. These concerts get incredibly crowded, and tickets are almost impossible to get, so check out the Summerstage link and plan your summer accordingly! The lawn at Bryant Park opens at 5:00 PM, the movies start around 9:00. Not a space can be found by 6:00 PM, so popular is this NYC summer tradition of free classic movies outdoors. Pack a picnic, invite good company, and prepare to settle down for a night you won’t forget. This year’s offerings range from Tootsie to ET. And it’s all free! Offered twice weekly, this free yoga series provides challenging vinyasa flow to literally hundreds of yogis throughout the City. For the past ten years, Lululemon Athletica has been sponsoring this event, providing instructors and mats for New Yorkers in need of Zen. Namaste! Those reading this blog now see why Bryant Park is quickly becoming the favorite park of the locals! Every summer Bryant Park hosts hundreds of free events, twice a year they host Fashion Week, and once a year they host a spectacular gift bazaar, complete with a free ice skating rink. 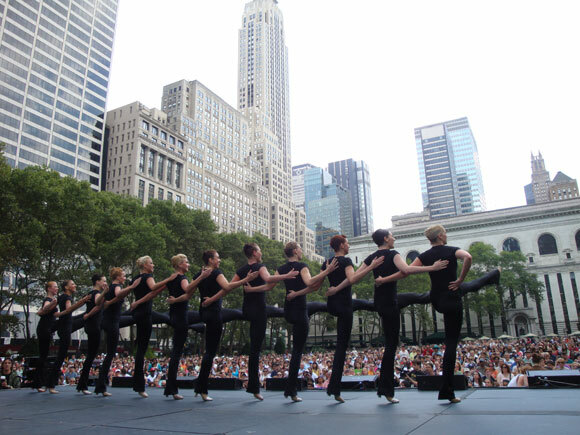 But Broadway in Bryant Park holds a special place for Shop Gotham tour guides, most of whom confess an unadulterated love of musical theatre. Every Thursday throughout July and August, the most popular Broadway shows perform their biggest hit. The ONLY way to see Broadway for free!